Pictured below is an example tube from the MRC 200 series with its full description, MRC 200 0508 ROT-GS 1003 (part # 9890-000-85142). We'll tackle that description segment-by-segment. 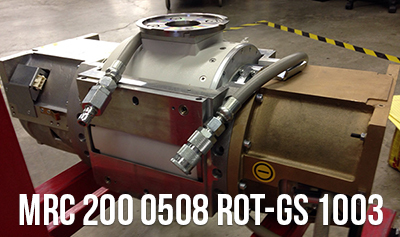 The "200" refers to the diameter of the tube's rotating anode, 200 millimeters. The MRC 200 is a two-filament X-ray tube, a small filament and a large filament. In the pictured example, the small filament has a diameter of 0.5 mm and the large filament has a diameter of 0.8 mm hence, 0508. Another common MRC 200 variant has "0407" in this spot and a small filament of .04 mm and large filament of .07 mm (0407). The difference in filament diameter is indicative of the tube's intended use. 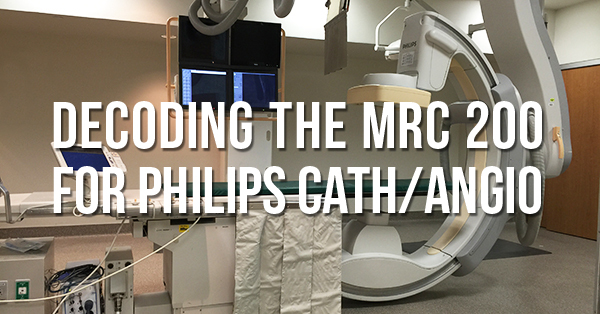 The MRC 200 0508 is for cardiac systems and the MRC 200 0407 is for angio and neuro systems. When you see an MRC 200 with a ROT of 1001 it is describing a housing with rubber HV plugs rather than the ROT 1003 or 1004 that has a "candle stick" type end on the HV cables. An MRC 200 0508 with a ROT 1003 is interchangeable with an MRC 200 0508 ROT 1004 but not interchangeable with an MRC 200 0508 ROT 1001. Finally, when you see “GS” in the description it is telling you that the tube has a grid switch. The grid switch eliminates distortion during the brief period when your tube is ramping up its kV for fluoro. Tubes with grid switches are now standard. If you need an MRC 200 tube now or are simply preparing for the day when you will, we can help. Our parts team can find you the right tube and our service team can dispatch the engineering personnel you’ll need to have it installed. Whatever your particular need might be, we’re ready to help. Contact us to start planning your next solution.